Note: This is a reference manual for those already familiar with Stencyl. If you are a newcomer, we recommend running through Chapter 4 in full instead. Chapter 4 covers the fundamental concepts behind scenes. What is the Scene Designer? The Scene Designer helps you build levels for your game. We call these levels, scenes. Summary: Stencyl works like Photoshop, Illustrator and other popular drawing apps. To select a single object, click on it while the Select tool is active. To select multiple objects, create a box around the objects you want to select by clicking the background and dragging, or CTRL + Click every object you want to select. Once an item is selected, you can move it or change the layer it's on. To move an item or number of selected items, click and drag it/them. To change the layer items are on, right click them and click one of the send or bring items. Select a Tile (or several!) from the Palette. Click and drag around the main area to place them. Note: To remove a tile that is already placed in the scene click on that tile and press the " backspace " key. Tip: To select multiple tiles at once, click and drag to draw a box around the tiles you want to select. Selected tiles are indicated by a box with a yellow border. Select an Actor from the Palette. Click to place the Actor. You can click and drag around to place multiple Actors. Layers determine whether an object is drawn at in front of, or behind other objects. You'll see this menu. Pick the desired option. 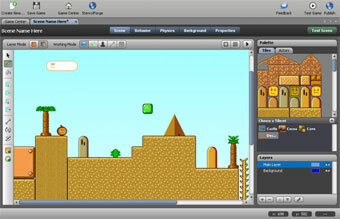 Located at the top, the Task Bar lets you switch between different areas of the Scene Designer. Scene is the actual scene editing area. Behaviors lets you manage the Scene Behaviors you have attached to this scene. Events lets you manage the Events you've attached to this scene. Physics lets you adjust the physics settings for this scene, such as gravity. Atlases lets you manage resource usage for this scene using the Atlas Manager. Properties let yous set your scene's size, the background color and name. The toolbar gives you control over what you can interact with in your scene. It also lets you change the current scene's display options. 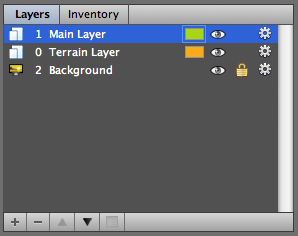 The Layer Mode determines whether your selections only grab from the current layer or from all layers (default). The Working Modes let you work with specific kinds of objects within a scene. The toolbox controls which tools are currently active. Tip: Press SPACE to shuffle between the main tools. 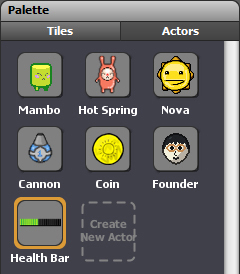 The Palette lets you select Tiles and Actors from your game. You can then, using the Pencil Tool, place them onto the scene. Tip: You can select multiple tiles at once in the Palette by clicking and dragging the selection box. The Layers Pane controls everything related to a Scene's layers (and backgrounds). You can reorder layers, rename them and change their properties (blend mode, opacity, scroll speed) among other things. The colored box corresponds to the color used to draw the selection box (when the Select Tool is active). This lets you tell different layers apart when selecting multiple objects at a time. The eye toggles the visibility of the layer inside the editor. Click to toggle this setting. The lock prevents edits to a layer. Click to toggle this setting. The cog, when clicked, brings up a popup with properties to edit, including the name, opacity, blend mode and scroll factor. Tip: You can also double-click a layer to rename it. The bottom part of the Scene Designer will show you the x and y coordinates of the mouse as well as the zoom factor. Hold shift to snap your selection to the grid. Mouse over the corner of an actor, click and drag the rotate icon to rotate the actor. 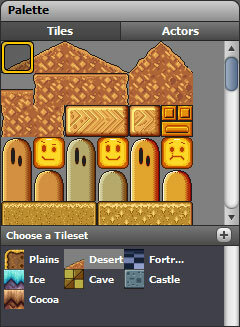 You can select multiple tiles at once in the Palette by clicking and dragging the selection box. Is there a way to rotate an actor in the Scene Designer? To Swastik Dilip: First figure out the dimensions of your background in pixels. 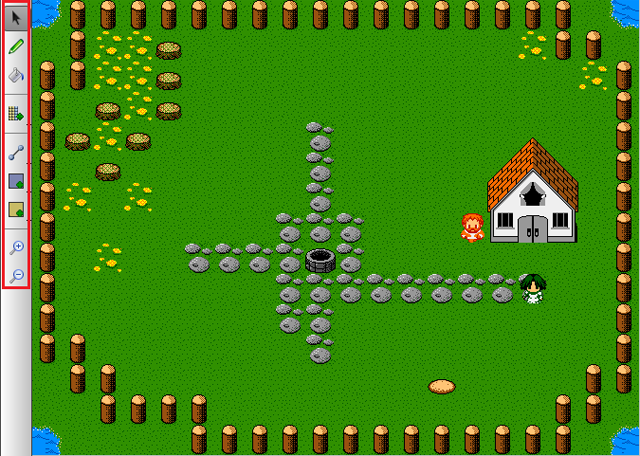 Then adjust the scene's (or the game's) dimensions to match the background's. Is there anyway to separate the Actor from the tiles? Too bad you can't copy or duplicate actors. How do you erase an actor you don't want in the scene? This is probably obvious but I don't see it. Ok.How do you scroll down the scene in testing. How create an actor on a specific layer? ?